Permaculture is definitely about making links between different components in a system. “Chickens and other poultry are perhaps unique in the number of beneficial relationships which can be set up between them and other elements of a household, smallholding or farm”, Patrick Whitefield, “The Earth Care Manual: A Permaculture Handbook for Britain and other Temperate Climates”, p248. As you can see from the photo, ours are fully integrated into our vegetable garden. In fact, it would be true to say, a little too well integrated! 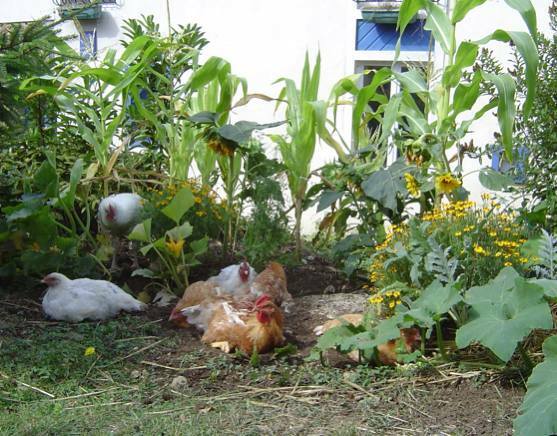 Permaculture chickens aren’t meant to wander freely around vegetable gardens as they will be quite undiscerning about what they scratch up, and what they eat. Where they are sitting is where I had planted some salad vegetables but the cultivated earth mixed with compost has been just too irresistible because of the possibilities it offered for a regular dust bath. The fresh green shoots of the salad crop would have been nibbled anyway, if they had survived. Having accustomed the chickens to courgettes—we give them any excess or those monsters that hide under the big leaves and grow into marrows—they’ve now started to eat them on the plant. The chickens look much more grown up than when I last saw them, they have all the red round their faces. How are they getting on? And do you have the new ones yet? Hi Christina. Thanks for asking about the chooks. They are all fine thank you. We now have four new ones, three little blacks and a speckeldy hen who are all very sweet. There are still no eggs unfortunately! Apparently it takes about 6 months before they start to lay so they should start any day now. I'll let you know as soon as it happens.